Two posts in a row with bacon…what’s going on here? Well, as stated before, I don’t buy bacon all that often, so when I do, I like to make the most of it. The bacon wrapped parsnips used less than a full package of bacon, and I felt that using the remaining few slices for something more creative than a crispy side for some eggs was the best way to go. 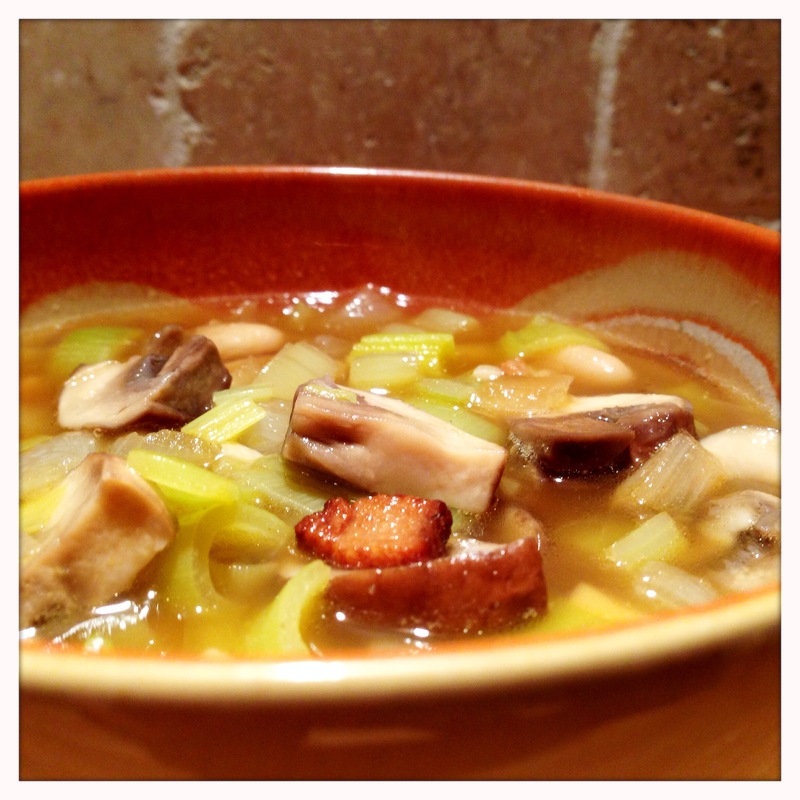 So this is a rehash of my favorite homemade leek soup…but with bacon! If you search for “bacon leek soup” recipes, you will likely primarily find a variety of ways to make a creamy potato and leek soup with a hefty dose of heavy cream. Don’t get me wrong, I love those heavy potato-leek puree soups with crispy bacon, but that’s not what we’re going for here. 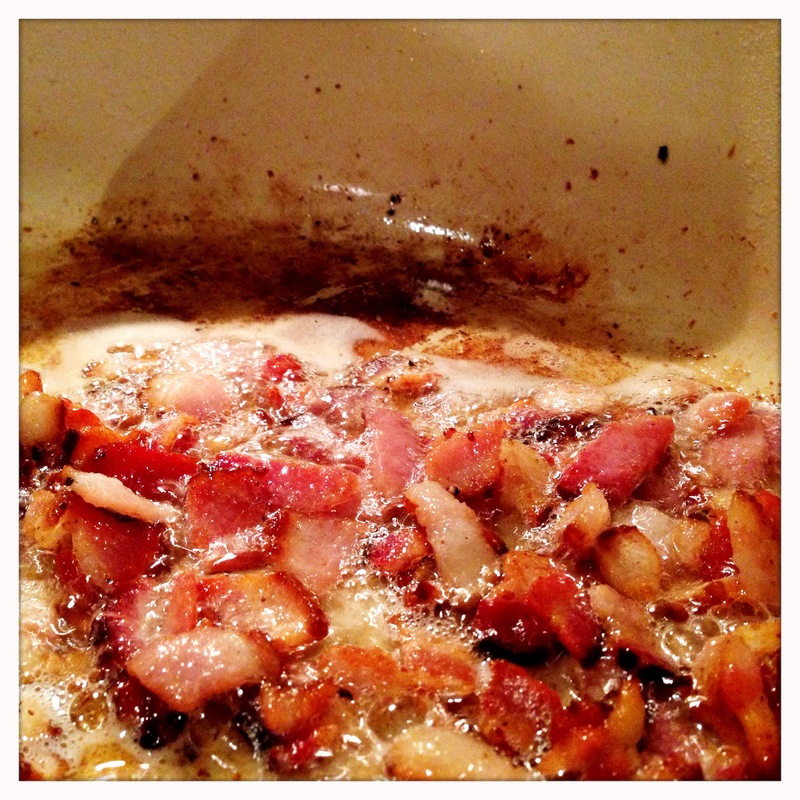 Instead, the bacon is adding a little bit of smokey, fatty deliciousness to an otherwise very healthy soup. And, the end result is a (reasonably) healthy recipe that features the flavor of bacon. Let’s do this! 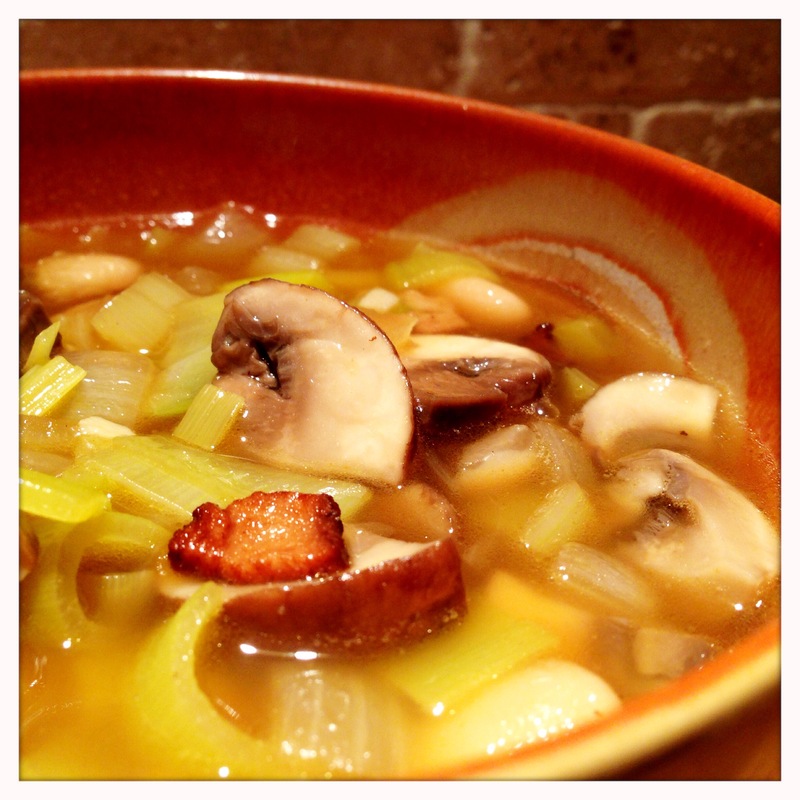 The only significant fat in this soup comes from the bacon. So when you consider this makes about 6 meal-sized servings, each serving is only about a half a slice of bacon – not really so bad. Heat a heavy pot over a medium flame. 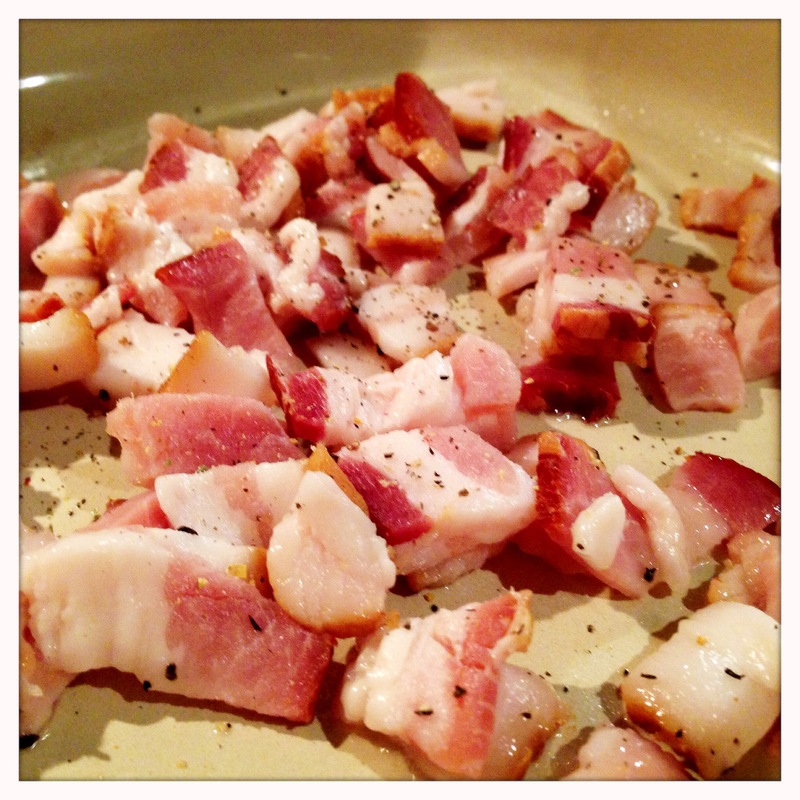 Once hot, add the bacon and season with black pepper. You want to render the fat out and crisp the bacon slowly without burning it. Keep it moving to help prevent burning. 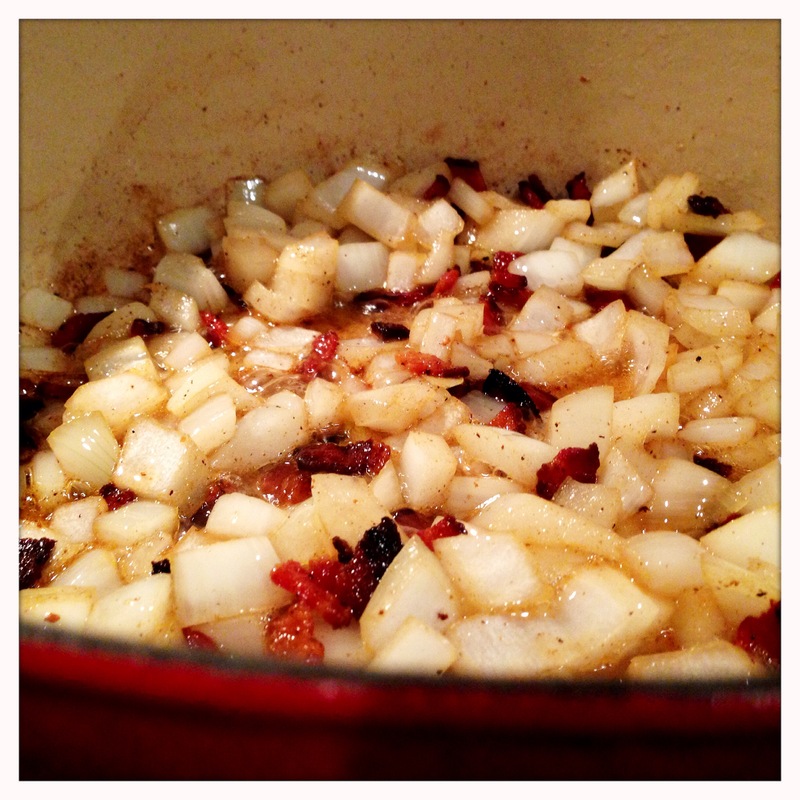 Once the bacon is crispy, add the onions and garlic, and saute them in the bacon fat. 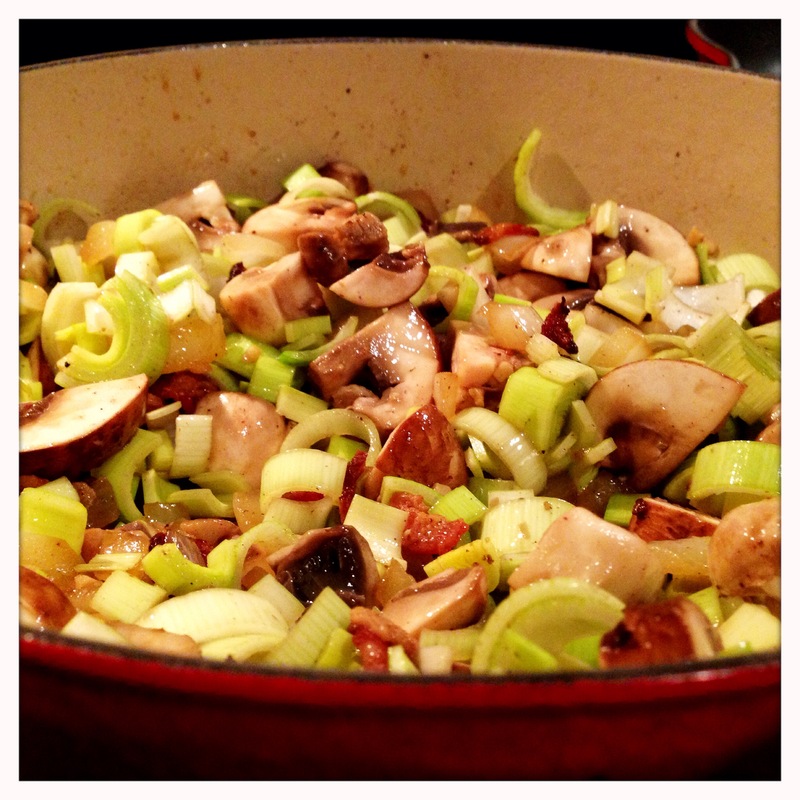 As the onions start to soften and become translucent, add the mushrooms and stir. Finally, add the leeks. Stir to combine and saute until the leeks start to become tender. They will finish cooking once the stock is added, so take care not to burn the leeks. 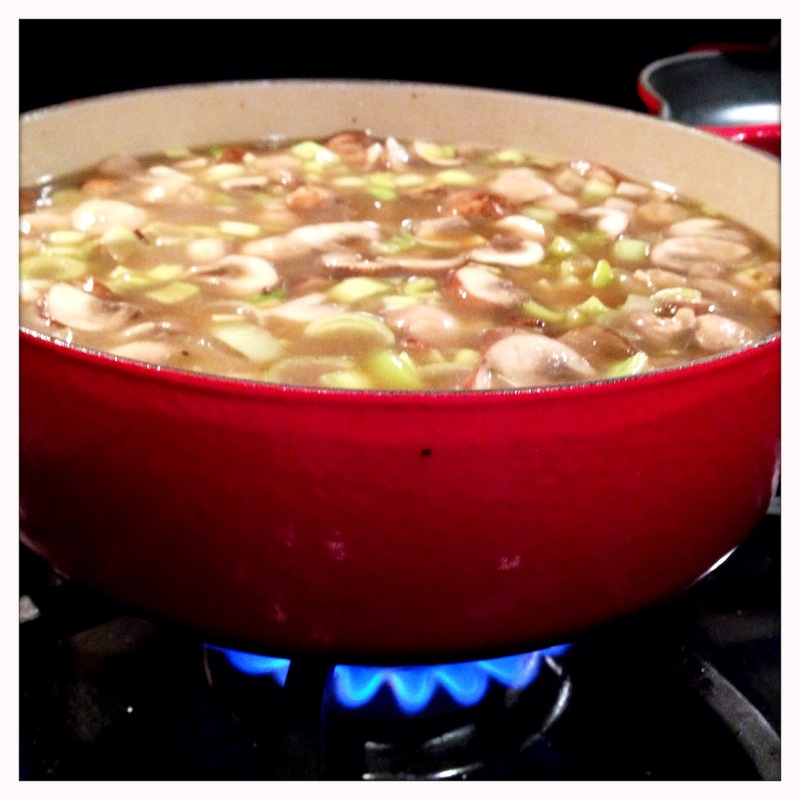 Add a few ounces of stock to the pot, and use the liquid to loosen up the the brown bits on the bottom of the pan. Chefs call this deglazing. Everyone calls it delicious. Once you’ve got all those tasty bits from the bottom of the pan freed up into the liquid, add the rest of the stock and the beans and turn the heat up to medium-high. Once the soup starts to boil, roll back the heat and simmer gently for at least 20 minutes, preferably 30. While the soup is simmering, taste the broth. Add more black pepper and/or a little hot sauce based on your tastes. I usually put a few drops of hot sauce into all my soups. Given the volume of the soup, a few drops are far too dilute to make the soup “spicy,” but the hot sauce adds a little depth to the flavor of the stock. 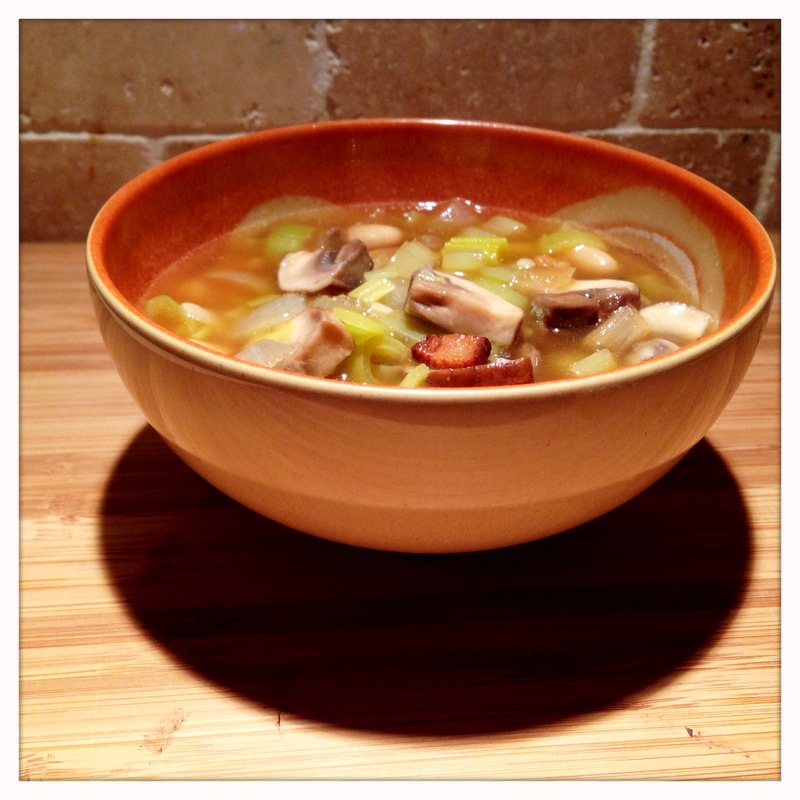 After the soup has simmered and you’re happy with the flavor of the broth, ladle out a few bowls and enjoy. The smokey bacon with the earthy leek and mushroom flavor are perfect for a rainy, cool evening or a casual weekend lunch. Like Batman disguised as Bruce Wayne, the super powers of bacon are well hidden in this humble bowl of leek and mushroom soup. Unleash the bacon, and your family will thank you – Enjoy!